Save The Children! An Update on the Karachi Children | the "silent" majority no more! An important story: SAFER works to save American children (born of Pakistani parents) from the indoctrination in these madrassas. BUT…The Silent Majority asks, “Why SAFER , are you not also deeply concerned that these children are being trained to be jihadis once returned to the States. ?” “Why deny the obvious intent of these madrassas? !” Bring the children home. Make sure they get a good American education, yes! But, also…make sure you are freeing them from the jihadi indoctrination. Atlanta, GA – Ericka Pertierra, founder of the South Asian Foundation for Education Reform (SAFER), called today for the immediate return of Muna Abanur Mahamed, an American girl currently held on an expired religious education visa at the Jamia Binoria madrassa in Karachi, Pakistan. Last month, Pakistan’s Ministry of Foreign Affairs ordered Maulana Mufti Mohammed Naeem, the madrassa’s founder, to return Muna and two other non-Pakistani students to their home nations. The children are being held due to the expiration of their religious education visas to study Islam and the Koran. “Yes we have received the deportation orders but we will not hand her over,” Maulana Mufti Mohammed Naeem, founder and head of the Jamia Binoria madrassa, a 12-acre sprawling walled compound seminary, told the Deutsche Presse-Aguntur news service. “No one could dare come near a one mile radius of our compound,” he said. In early July, SAFER worked with U.S. Congressman Michael McCaul to secure the release of Noor and Mahboob Khan, two brothers from Atlanta also held at the madrassa on expired religious education visas. The 2008 documentary ‘Karachi Kids’ by filmmaker Imran Raza found nearly 80 American children currently attending Pakistan’s Jamia Binoria madrassa. Jamia Binoria is among an estimated 15,000 Pakistani madrassas. The madrassas recruit children as young as six from around the world to study Islam and memorize every verse and phrase of the Koran. 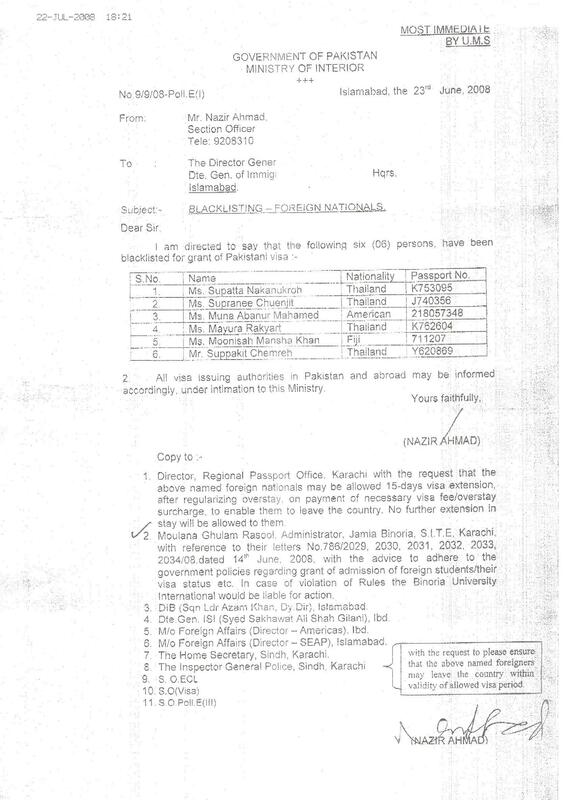 Also, see the official document from the Pakistani government regarding blacklisting foreign nationals.